Many people suffer from acid reflux symptoms, a small amount of reflux in normal for most adults. Our stomachs naturally produce acid to digest food. Sometimes this acid flows back into the esophagus, the tube connecting the throat to the stomach. This is called reflux. A symptom of reflux is often heartburn and many people temporarily mask this by taking over the counter medications. 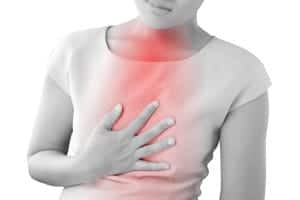 The stomach acid from reflux can permanently damage the esophagus. In fact after years of reflux, the tissue may be so damaged it leads to a condition known as Barrett Esophagus. This is where the cells in the lower section of the esophagus are abnormal. Most people who have Barrett Esophagus do not know they have it. Having Barrett esophagus increases the risk of cancer of the esophagus. Having this higher risk does not mean the person will get cancer of esophagus, but it does increase the risk factors. The most common symptoms of esophageal cancer are heartburn, weight loss, difficulty sleeping, pain when swallowing, pain in the chest or neck, a hoarse voice or cough that doesn’t go away within 2 weeks, food getting stuck in the esophagus or food that may come back up. People who suffer from acid reflux should visit an ENT doctor who can perform an office procedure that requires no anesthesia and has no down time, Transnasal Esophagoscopy. Another test is a Restech Dx-ph test that is inserted into your esophagus for 24-48 hours to collect ph data and send to a recorder. During this time, you eat normal meals, go to work and perform your everyday activities. You can’t feel the tiny sensor and it does not interfere with your eating or swallowing. The measurements of this test will help your ENT doctor correlate your symptoms and any reflux you are having. Treatment may range from lifestyle changes for mild cases to more aggressive therapy with medication for moderate to severe cases. In extreme cases, surgery may be recommended. There are things you can do at home to help you start feeling better. To schedule an appointment with the Ear, Nose and Throat Institute, please call 770-406-6587.